I still haven't quite recovered from the weekend. Abby mentioned in her blog the other day about feeling like you need a vacation after a vacation. I agree. It is hard to get back into the swing of things after I'm away from home, even for a couple of days. And it doesn't help that it's been rainy, dark and dreary around these parts all week. I'm tired of it! To lift my mood, I knit this hat. But somehow I messed up and it ended up being pointy on top. I guess I wasn't thinking straight when I was decreasing! To fix it, I just added a tassel and voila! Instead of "Le Slouch" it's now more like "Le Elf." Actually, it kinda looks like one of those white chocolate candy kisses. 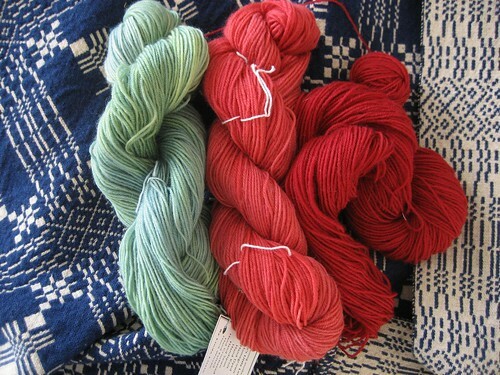 :) I used a lovely skein of wool/silk yarn I picked up when I was in Chicago. I was worried I wouldn't have enough, because there was only 130 yards and the pattern calls for something like 200 yards, but I ended up having plenty. 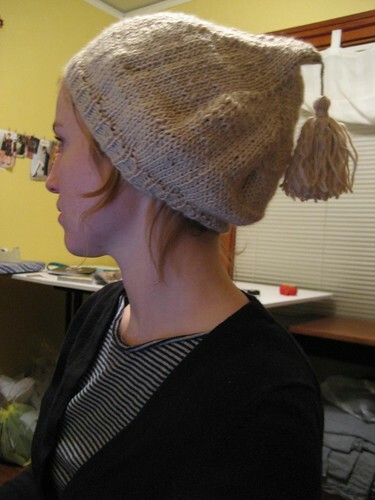 I used size 9 double point needles and it's definitely big enough for my head, maybe a bit too loose. I haven't blocked it yet and could probably make it just a tad bit smaller. I should have used my size 8 double point needles like the pattern calls for, but they were being used for another project. So I cheated. heehee. You'll have to forgive me for the poor quality of picture here and my messy sewing room in the background. I don't know why I even bother to take pictures when it gets dark out. The lighting is horrid. I picked up this yarn at the living history event I attended over the weekend. A lady who attends several of our events likes to hand dye her yarns with natural dyes and she also spins (though these yarns are not hand spun). I wanted to swipe every skein of yarn she brought with her, but I resisted. By the time I got around to purchasing some, most of them had been taken anyway, but I did end up with some lovely colors. The red and pink will probably turn into striped leggings and the green I am thinking of making into some toasty wrist warmers as a gift. We'll see, though. I may decide on another project for them. But they are soooo soft and lovely. Tonight the Pioneer Woman updated her terribly addictive love story. Hey, what girl doesn't like a good love story? And it's a true story to boot. I'm hooked. And she keeps you hanging! For months at a time! It's cruel. Then again, it's worth the wait, 'cause it makes me feel all warm and gushy after I read it. Tonight I went over to the sitting room, turned on a lamp so it has that cozy warm lighting. Curled up on the couch and read the next chapter. I know I know, I'm pitiful. Well anyway, I'm off to try and be more productive. I'm trying to think up ideas and it's been slow going today. Maybe tomorrow the rain will stop pouring down. I hope! Take care all and stay cozy! just wanted to say hi from the other side of the world. You're very inspirational and original and your art is wonderful. So not mainstream and "designerlike". Your blog is for me a inevitable reading every day. A lot different from all the craft and design blogs. I kind of tired of reading them, like decor8, there so materialistic. Your art is wonderful! Really enjoying reading through your blog! oh!! what a sweet hat,indeed! 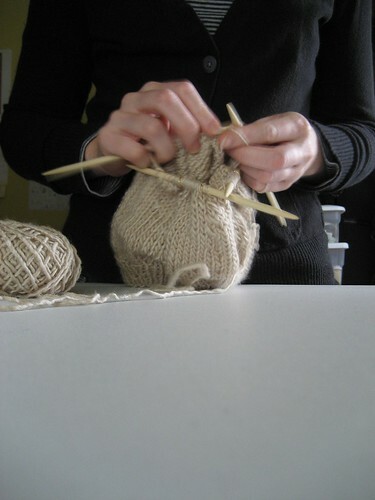 I wish I could teach myself this elusive knitting in the round thing!! Love the wee tassel,too!! I hope you get some sunshine soon! I knit "le slouch" a few days ago, too (will post pictures on my blog soon - at the moment I got a cold and definitevely do not want to have this red nose on any picture.... *lol* ).